Wish I had a better version of this postcard, but at the present, I don't. At any rate, here's another mall I haven't covered yet, so that's always cool: the Bay Fair Shopping Center (as it was originally named), which was renamed "Bayfair Center" in 2004. I also see it referred to as just Bayfair Mall, too, so take your pick. Anyway, in this old shot, aside from the large Woolworth's store in the middle, I can't quite make out the names of the other ones, though it looks like the store on the far right says something "King" (Drug King? ), but I'm really not sure. Developer: R.H. Macy & Co., Inc.
Ah, my favorite Target is here (but not in the photo). Drug King is where they are building an Old Navy now. It was Long's Drugs for a very long time. The mall is enclosed now and the new owners have radically renovated most if it. Some parts remain unchanged from the early Eighties, like the food court and second level. You can read the history by following the Wikipedia link, which has a link to my Website, which has more pictures of the mall today. Sorry to toot my own horn!! Drug King was Rexall's attempt to compete with chains like Thrifty, Payless, and Longs. I don't know if Rexall actually owned them, but the stores DID sell their products and displayed their signs. There were a lot of them in the Oakland/East Bay area. Yea, the first part did look like it said drug even though I couldn't make out king. But now that I really look at it does say Rexall on the right of the Drug King. This is such a groovy looking shopping center with awesome cars! You've hit very close to home with this one. Thanks for incuding it in your blog!! I used to tag along with my mother to this mall quite often where she would shop with one of her friends. For the longest time Bay Fair had one of the only Macy's stores in the East Bay. (It's the large building in the background.) The second department store built on the site was Ward's which was to the right. Bay Fair started out as an outdoor mall and even had cool outdoor escalators (still in place). In the 70's the landscaping was forsaken in favor of enclosing the mall, making it dark and gloomy. An eighties overhaul introduced more skylights but covered the floors with white, pink and apple green tiles still there today. Bay Fair had the misfortune of being built in a very low income area with lots of crime scaring away the nice people. The demographics are slowly changing and the mall is finally getting an extreme makeover. Because it was built piecemiel though, Bay Fair suffers from a poor layout. There are some very strange space inside it. As a side note, the building to the extreme left in the photo was the Pinecone Restaurant. It had awesome oversize naugahide chairs prevalant in finer 1960's restaurants. It has since been torn down, (along with other parts of the original building), and replaced with a new Kohl's. I wish I remembered what the tall sign in the background was about. It looks pretty cool. "I was thinking that that had to have been the biggest friggin' Woolworth's I've ever seen." Hehe. Actually the coolest Woolworth's I remember was at the corner of Market and Powell in San Francisco. It was a huge store that had lunch counters, bakery and deli areas. It offered a unique atmosphere that to me well represented San Francisco. It also had a neat downstairs basement that one cound enter directly from the underground BART station. The Woolworth's you see in the photo was not as big as others. It has been replaced with a Bed Bath & Beyond. Wow great photo. Wonder how much all those cars would be worth if you sold them today! Not familar with the Bay area but I guess this is near Oakland? San Leandro is immediately south of Oakland. At one time, you'd think the inside of this mall was the ghetto of Oakland, but it's improved significantly in the last year. The part of Bayfair directly in front of Macys was demolished in order to build Kohls and Bed Bath & Beyond. Both stores open out onto the mall like Woolworths and the other old stores did, but they are new buildings. The old Bayfair Woolworths was a pretty typical size, despite its appearance. Downtown San Francisco was indeed the World's largest until it was downsized in the 80's and converted to a Woolworths Express in the basement with Gap and other retailers filling in the old street level. It was quite common for major cities to have huge Woolworth stores in their downtowns. Houston, TX had one that lasted all the way until the end. There were however, some pretty big mall Woolworths as you got into the late 50's and 60's. Southland Mall in was an example in the Bay Area. It actually was on two levels, though it never had an escalator. With such a range in store sizes, I've often felt they should have branded the discount Woolco stores Woolworth as well. The name recognition may very well have given them a big enough boost to where they'd still be around today. You're right, Southland (in Hayward, CA) did have a pretty good size Woolworth's. Going down to the basement level was always a treat because the pets and toys sections were down there. It pretty much kept it's character right up to the end. I also remember next door was a Harvest House restaurant. Recently, I was exploring around Southland's basement level and came across some of the original seating in the community room. Very 50's airport style seating with the sling "leather" seats. Anyone have any pics of early Southland?? It was one of Taubman's first indoor malls and was supposed to compare to Southdale in Edina, MN. I believe that BAY FAIR was the first suburban, regional, shopping mall to be accessible via a heavy rail rapid transit system (namely, BART). BAY FAIR station was on the first segment of the Bay Area Rapid Transit to open (MacArthur-to-Fremont, I believe). This was in September of 1972. I am not tee-totally certain of this, and any info to the contrary would be appreciated.....There were, also, at least a couple major shopping centers that were accessible from trolley car-type systems (Stonestown via San Fran's MUNI and Springfield Mall, via Philly's SEPTA). Dean, stay tuned. I just scanned some awesome photos of Southland its first year from an Architectural Record magazine. It's got some great photos of the aviary and fountains. Check my blog, if you haven't. I'll post them next week. Didn't Woolworth's have an eatery downstairs, too? I tell ya, that underside of Southland is straight out of a nightmare (you know the kind, running like a snail down a long hall while being chased by some fast-moving something). Scott, I look forward to seeing your photos and your blog is really cool. Thanks for posting those mall logos! One downstairs eatery that I do remember is the coffee shop in the basement of the Emporium in downtown San Francisco. It was decorated in pink. That's from the time when it was a bargain basement, and had other services like shoe repair. The eatery I was thinking of was the luncheonette counter. My parents wheren't one for buying meals at any stores. I only started going to The Village Cafe in Emporim-Capwell after I got an Emporim-Capwell credit card and discovered I could use it there! Regarding the Bayfair BART station, Anonymous, I think you're correct in that BART's Bayfair station was the first to be named for a shopping center. The New York subway stops at Parkchester in the Bronx, but that is a huge housing development, not just a shopping center. The Southern Pacific trains (now Caltrain) stop at the Hillsdale station in San Mateo, but the station was renamed Hillsdale from Beresford in 1941, 14 years before the shopping center opened. As a testament to the power of the name, BART called their station simply Bayfair (as opposed to San Leandro-Bay Fair). There is also an El Cerrito Plaza station on the Richmond line, but as you correctly point out, the Fremont line opened first so Bayfair wins. My father took us (by car since the San Francisco line hadn't opened yet) to the Bayfiar station to ride the new BART train. I still have an AC Transit transfer from the machine with the date stamped 11/11/72 (Veterans' Day). For some time, that was the busiest day ever for BART as many people took advantage of the holiday to ride the then-operating on Monday through Friday trains. An open roof deck like the San Jose Valley Fair store, does anyone remember if Macy's BF had a roof-top carnival in the first years? Yes, Bayfair did have a carnival, located at the upper terrace level, according to various Daily Review, 1957, articles. Kiddieland Bayfair had 14 rides, including a ferris wheel, tilt-a-whirl, octopus and the same sports car ride featured at Disneyland’s Tommorowland. Managed by Gene Cardoza, who also oversaw the rooftop Kiddieland “Skyrides” at San Jose’s Valley Fair, the park was open seven days a week at a cost of ten cents per ride. During Christmas, a helicopter landed near the Kiddieland area with Santa and his helpers, accompanied by the USMC 60-band to kick off the season, as they did with their Valley Fair sister in San Jose. Unlike Kiddieland Valley Fair’s short life (1956-1957), Daily Review ads for Kiddieland Bayfair were posted well into the early sixties. Santa Clara Valley in the Fabulous Fifties! What was the name of the ice cream parlour that used to be there in the later 70s? It was like Farrell's but called something else. Do you know which ice cream parlor was located here? My cousins, brother and I swear it was Farrell's. One of my cousins even lived next door to Bay Fair Mall and had her 8th birthday party there; this was in 1975. They lived next door to Bay Fair until 2002. However, my friend and his family swear that it was Dreyer's. How can two families have entirely different memories? It's driving me bonkers. I've contacted Dreyer's but they do not keep a hisorty of locations as does Farrell's. Can anyone here help me determine which one it was? Does anyone remember the playground on the roof of Bayfair? 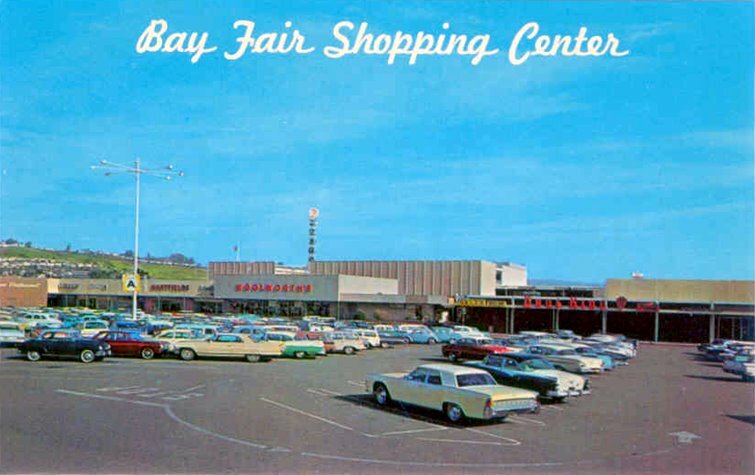 One day each week my mother would take my grandmother to shop at Bayfair since she couldn't drive. 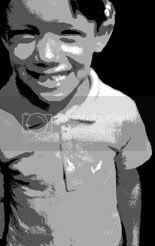 I was maybe 6 or 7, so I came along too. This was the late 1960's, but I can still remember it pretty well. The Woolworths did have a nice size resturant area, and when you exited the back of the store you'd go about 10' before walking down some cement steps. One of the stores pictured is Hartfield's, which was a clothing store, I think mainly for woman. I also remember Drug King and the Pine Cone resturant. I remember at some point at the top of the escalator was a toy shop, that I think was opened up at the holidays. I bough a model car there, and I remember the floor being unfinished, like plywood. Near what would later become Wards, there was a good size bowling alley, and later a dairy Queen, where they had my favorite childhood meal: the Sizzledog. It was just a hot dof that was split down the middle and fried, but it was good! Lastly, I was too young too see the Kiddieland park, and would love to see pictures of it. I've tried web surfing and You Tube with no luck. What a cool web-site this is! Dreyers was definitely the ice cream parlor that was in Bayfair... it was over near Montgomery Wards... I had my tonsils out when I was 5 in 1975 and made my grandparents take me there when I got out of the hospital! There also used to be a Drive In movie theater directly in front of the mall which is now where Ross and a little strip mall now exist. By the way... Macy's is exactly how it was back in the 80's when I hung out there as a teenager.. funny how time doesn't change some things. I miss the indoor bumper cars at Southland! After school, from 1969 -1971 I worked at the Dairy Queen located along Hesperian Blvd. near the mall. Sometime in the '70s the Dairy Queen building was taken over by a local hot dog chain. Between Dairy Queen and the main mall parking lot there were two drive-in movie theaters next to each other. I believe, before the mall was built, the area was a car racing track. My family used to order chicken to take out from Pinecone. I remember it fondly. Was that the only one or was it a chain? Ice Cream, we all scream for Ice Cream. It was a Dreyer's. We went there alot. Our daughter worked at Farrel's. It was at Southland. A friend of my husband's convinced Dreyers to let us use their name and we opened a restaurant patterned after Farrells in the Bay Fair Mall. The restaurant was not owned by Dreyers but used their ice cream exclusively. It was called Dreyers Ice Cream Parlour Restaurant. Twenty years later in Portland we chanced to met the manager of a Newport Bay Restaurant ( Newport Bay was started by the original owner of Farrells). The manager and his wife had met at age 16 when they had worked together at our Dreyers Ice Cream Parlour Restaurant in Bay Fair Shopping Center. Well, I guess the ice creme parlor mystery has been solved. Though I was sure it was Farrell's at Bayfair, it seems it was a Dreyer's after all... Did they wear the old time hats, and serve a HUGE ice creme dessert in a big cart that they wheeled out? Farrell's was at Southland mall in Hayward. I had a birthday party there as well. I remember the Huge ice cream wheeled out on a cart with all the employees singing. It was near the Ice Skating Rink. I think the ice creamer parlor in Bay Fair Mall was Fenton's NOT Dreyer's. I actually worked at that Dreyer's Ice Cream Parlour in the summer of 1974. It was a summer job while I was attending San Jose State University. I lived in the Washington Manor district of San Leandro. Dreyer's had an entrance that overlooked the parking lot that led up to Woolworth's and Longs. The entry way had the cashier and was a holding area for people waiting for tables. To the left was the dining area that had 2-1/2 aisles of 6 booths each, and there was an area next to it that just had tables. Away from the parking lot side was our ice cream area, and behind that was the kitchen. Next to the kitchen was a washer and dryer, supposedly used to clean the towels that we used to wipe the tables. However, when you smell the tables and towels at many restaurants, they're mildewed. Ugh! Wash those towels more often than every 3 or 4 days! EVERY day would be smart! After a short while I was "promoted" from busboy to the ice cream bar. That was a ton of fun. When the manager wasn't around, we'd play around by scooping at one end of the bar, and flinging the ice cream scoop to another guy down the walkway making a shake. You don't do that trick with sherbets, though. They tended to fall on the ground (that's why we played when the boss wasn't there). Wages back then for the waitpeople was $1.35. The rest of us got $1.65. That's because the waitpeople got tips. Now, in that place and in those days, tips were almost all coins, not dollars. Yes, people did leave pennies. Later during my stay at Dreyer's, the manager let me order the ice cream weekly from our main company in Oakland. First thing I did was order more vanilla! We would sometimes run completely out of that on weekends because vanilla went into probably 80% to 90% of all the sundaes. When the Dreyer's truck came in, I put the tubs on a hand truck and wheeled them into our medium-sized walk-in freezer. Sometimes it took 15 to 30 minutes to move everything around so that it all fit in. Lots of other stuff was in there like the restaurant side's big hunks of roast beef. On Friday and Saturday nights the place was full of ice cream loving customers. The entry was full of people waiting for a table for the entire 4- or 5-hour night shift. If you were working the ice cream, the spinning wheel would constantly be full of orders. I remember never seeing anything but the ice cream for the entire shift. When we went home, our arms were covered with a thin layer of ice cream. Looking backward at it, that was a ton of work for $1.65/hr. But -- it was a lot of fun and almost everyone who worked there were good friends. Dreyer's was bought in June 2002 by the megacorporation Nestle. Now I have no idea where the ice cream is made, and I don't trust that it's as good as it was in 1974. I also don't know when the Dreyer's Ice Cream Parlour at Bayfair was shut down. By then I'd started living in San Jose permanently. As I remember, there were only 4 Dreyer's Ice Cream Parlour Restaurants back then. I'm pretty sure all of them have closed. I also don't buy Dreyer's at the grocery store much because it's a premium high butterfat product that they charge $5.99 or more for 1.5 quarts (yeah, no more half gallons since a long time ago).